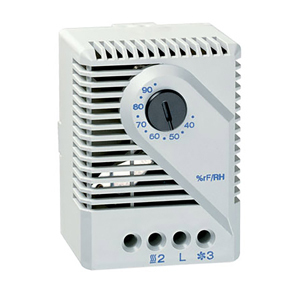 The MFR012 is designed to control the relative air humidity inside of enclosures. When connected to an enclosure heater, (de-humidifier), it will turn the heater on at the set humidity level in order to raise the dew point. This helps prevent damage and malfunction of electronic components caused by condensation and corrosion. The MFR012 can also be used to control cooling fans, warning lights or other devices. Note: The critical relative humidity for most components is 65%. Above 65% RH, condensation can cause malfunction of electronic equipment. Long-term, this can lead to corrosion and permanent damage of electronic components and systems.